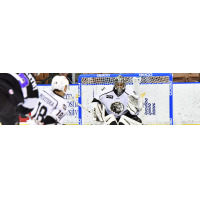 MANCHESTER, N.H. - The Manchester Monarchs defeated the Reading Royals, 4-3, Monday night at Santander Arena, in Game 3 of the North Division Semi-Finals. The Monarchs (3-0) took a commanding, 3-0, series lead with a 4-3 overtime victory over the Royals (0-3) for their third straight overtime win. The Royals started the scoring at :50 of the first period on the 2nd goal of the playoffs for Matt Wilkins. Chris McCarthy took a shot from the top of the left circle, where Wilkins picked up the rebound at the left post and took a shot past the blocker of Monarchs goaltender, Charles Williams, to make the score, 1-0. Manchester answered with a power-play goal at 9:39 of the first period on the first goal of the playoffs by Colton Saucerman. Rob Hamilton sent a pass across the blue line to Saucerman, who took a one-timer from the top of the right circle, that beat the blocker of Royals goaltender, John Muse, to tie the game, 1-1. Reading regained the lead at 15:14 of the first period on the 2nd goal of the playoffs for McCarthy, on the power play. Matt Willows pushed the puck to Adam Schmidt just inside the offensive blue line, where Schmidt slid a backhanded pass to McCarthy in the slot. McCarthy deked in front and sent a snap shot past the glove of Williams, to give the Royals a 2-1 lead. The Monarchs tied it back up just :43 seconds later, at 15:57 of the first period on the 2nd goal of the playoffs by Sam Kurker. Michael Doherty skated from the goal line to the top of the right circle, where he fired a shot towards goal, that bounced off Muse and into the slot, where Kurker gathered the rebound and beat Muse to the blocker side, to even the score, 2-2. The Royals jumped ahead at 5:26 of the second period on the 1st goal of the playoffs by Nolan Zajac. McCarthy sent a backhanded pass from the left circle to Zajac at the point, where he took a slap shot past the glove of Williams, to give the Royals a 3-2 lead. The Monarchs tied the game again at 11:21 of the third period on the 1st goal of the playoffs by Zac Lynch. Wilkins tried to clear his own zone, where Lynch met the breakout pass at the top of the slot and ripped a one-timer over the blocker of Muse, to tie the game, 3-3. Manchester won their third-straight overtime game on the 1st goal of the playoffs for Hamilton, at 17:24 of the overtime period. Matt Leitner skated the puck up the left wing, where he found Hamilton with a pass in the slot. Hamilton kicked the puck to his stick and fired a shot that beat Muse between his legs, to give the Monarchs a 4-3 victory. The Monarchs are back in action Wednesday, Apr. 18 (7 p.m.) in Reading, Pa., for Game 4 against the Royals at Santander Arena. The Monarchs were shorthanded eight times in the game. Charles Williams made 38 saves on 41 shots. John Muse made 52 saves on 56 shots.